Mention “Ohio Amish”, and most people think of the large settlement at Holmes County, or perhaps Geauga County to its north. But just a short ways down the road from the large Holmes settlement lies an often-overlooked but sizeable Amish community. Amish have lived in Ashland and neighboring Medina County for nearly sixty years. About 2,000 Amish live here, in 15 church districts as of 2008. In fact, you may have heard about the Ashland County group already–Joe Mackall’s widely-publicized book Plain Secrets was written about this community. 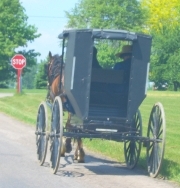 The Ashland-Medina County Amish are Swartzentruber Amish–one of the most conservative groups. The Swartzentruber Amish are most readily associated with the Holmes/Wayne County area, where they originated and have their greatest population. But the Ashland County group is in fact one of the largest Swartzentruber communities in the country, if not the second-largest. This group is also typically referred to as the “Lodi Amish”, after the name of a nearby town. I visited the settlement last spring, so consider this a delayed report. It happened to be a Sunday, so buggy–and all other–traffic was light on the roads. And while that meant no visits to Amish businesses (like all Amish, the Ashland County group closes up shop on the day of rest) I can report that there are more than a few, as is obvious by the many signs scattered throughout the community. As you travel along the grid-like roads of the area, the characteristic Swartzentruber homes are easy to pick out, with their creaky windmills, peeling red barns, rusty tin roofs, and generally weather-worn appearance. Long strands of gourd birdhouses are also common signs of Swartzentruber homes as well, and you see a fair share of them in Ashland and Medina Counties (Amish appreciate pest-eating birds on their property, and are particularly fond of purple martens). As in any growing Amish community, I noticed a good bit of new construction as well. Generally, Swartzentruber Amish families tend to be larger than the typical Amish family. Swartzentruber Amish build with wood and paint their structures red, and also use a tough red metal siding on their shops and outbuildings. Like other Swartzentruber communities, such as the Ethridge, Tennessee Amish, or the Amish at Harmony, Minnesota, Ashland and Medina County Amish businesses are relatively plain and simple. Baskets, furniture, produce, baking, hickory rockers, eggs, candies, jams and jellies are all common. Driving down the road, you’ll usually not see much more than a simple hand-lettered sign. For various reasons, Swartzentruber Amish are not big on marketing and advertising. However, the signs mean the “welcome mat” is out at a lot of the local farms. Farming, for that matter, is big here as well. Swartzentruber Amish, in fact, tend to remain in farming more than most of their more progressive Amish cousins. Researchers Charles Hurst and David McConnell note that “Among Swartzentruber Amish…the vast majority are farmers” (An Amish Paradox, p. 197). Study the history of the Ashland-Medina County group and you learn of a history of division that has extended across Swartzentruber society. Though Swartzentruber Amish–with their plain appearance, simple homes, and lack of a Slow-Moving-Vehicle triangle–look alike to most outsiders, there are in fact 3 separate Swartzentruber groups. In this interview, Karen Johnson-Weiner describes the conflicts that led to the division, some of which played out in the Ashland and Medina County group. Some of the differences between these groups are tiny–for instance, while some permit drip irrigation, others do not. Technically, the Ashland-Medina group is just one of a few lying within the borders of Ashland County. 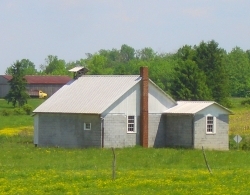 There is another sizeable Amish settlement–of 7 church districts–found near the towns of Ashland and Shiloh. That particular group is notable for its use of unusual grey-colored Slow Moving Vehicle triangles. This community extends from Ashland into Richland County. Another small community, of a single church district, can be found in Ashland County near the towns of Loudonville and McKay. The Ashland-Medina community is also sometimes referred to as the Lodi/Homerville settlement, by the names of nearby towns. And while the community technically lies in both Ashland and Medina County, there are also Amish households in Wayne County to the south. 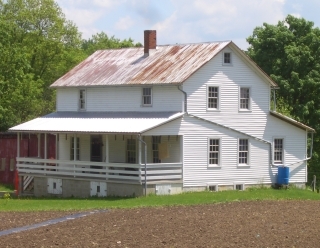 Homerville is home to an auction featuring Amish produce, held three days a week. Given how close it is to the huge Holmes County Amish settlement, most visitors pass this community by. And perhaps that’s how the Amish of Ashland and Medina County would prefer it. However, due to their occupational choices, even conservative Amish have “opened their doors” for business, and will be happy to sell you something to eat, or perhaps something to sit on. The Ashland-Medina County community is worth a visit if you’re in the area. Read more on the many Ohio Amish communities. I wonder if the Swartzentruber Amish think the regular Amish are maybe getting a little too comfortable and close with us English?. Richard from Penn. Richard, good chance you’d hear something like that if you asked the average Swartzentruber Amishman for his opinion. However ‘higher’ Amish, say in Holmes County, have their opinions about Swartzentruber Amish as well–just picking up things in conversation you sometimes sense they are looked down upon. However there is also a level of respect for them and the groups do cooperate to a degree. I know a regular Old Order Amish businessman who employs quite a few Swartzentruber fellas, and he’s not the only one. While not as prevalent, the settlement reaches up into the bottom portion of Lorain County also. In the 80’s I worked at a Bank in LaGrange Ohio (Central Lorain County) and I saw a few Amish horse & buggies come thru the town. My cousin married a young man with the last name Swartzentruber. His parents left the Amish when he was a child. I believe he said they were from somewhere in OH, although he gave a big geopgraphical area. Closer to Interstate 70 I think. My cousin’s husband works as a chef and can make the best pies! Thanks for the article and pictures Erik. As always, awesome job!! Sorry I have been so hit and miss lately. Been very, very busy and online time seems to be more and more limited. Very interesting! I have some friends in Medina and I will forward on! Thanks Erik!! I’ve said it before a few times and I’ll say it again, “Plain Secrets” is an EXCELLENT book. Joe Mackall is writing from an Englisher’s perspective, but I didn’t think that he romanticized the Swartzentruber Amish way of life nor did he bash the way of life. He just wrote about what it is like to live next to a Swartzentruber Amish family and be friends with them. Not a fan of Mackell's book. It might be a decent read, but shame on him for writing it when the family, and I know them well enough, did not want him to. But they wouldn’t tell him no. He knew. Typical self-serving English move. I’m always very interested in hearing about Geauga County Amish, as I have a “pen pal” (we’ve never met—been writing since 7th-8th grade) in Bedford, OH, and she often visits the Amish settlements in the area (how lucky she is, if only for the fresh eggs and produce). How interesting about the Swartzentruber Amish being somewhat looked down upon by other Amish…we’re all human, to be sure. I am wondering why I don’t see my posts anymore (I’ve written a few, lately, and I’ve even tried signing up again, but I’m told I’m ALREADY “signed up”!) I also don’t see the windmill in the Amish America heading at the top of the page. Maybe I should “clear out” my email files…don’t know if that would improve things, but I’ll give it a try. Swartzentruber’s are definitely looked down upon by other Amish. The group I was with was not Swart., but we were not far from it. We did not look down upon them, we just did not agree with them on a few issues. As long as those issues are not in focus, we got along great. Indeed, several Swartzentrubers drove their buggies over to my friend’s farm, and we raised a barn Wednesday. I noticed that several of the Swart. disappeared right after dinner. Most of the heavy lifting was done by then, anyways. I expect some of them had to get their smoking in and they knew not to do that in front of us. While I was Amish I experienced some of the ways low Amish are seen by higher orders. In one incident, I had not yet stopped driving my pickup and was in a larger, higher community of Amish on my way home to Northern Indiana. I was in a Amish general store, wearing Amish clothing, buying a pop to keep me awake while driving, when a young woman asked which Amish community I was from, when I told her, she immediately turn her back to me and stood there. I got the severely cold shoulder, you might say. In another incident, a New Order man spent long time in the bus station trying to get me to change to New Order, even following me right up to boarding the bus. He was pointing out all of the things he saw as wrong with low orders and how his was a better way. This was one of the few times I have ever seen any Amish try to convert someone from one type to another. For a large set of Amish picture albums, try this link http://eightlake.smugmug.com/Ohio-Amish Down towards the bottom of the list is a set of Swartzentruber pictures along with some explanations of how higher orders Amish see the Swartzentrubers, what makes them different, their rules, etc. While I was Amish, we refered to these Swartzentrubers as the Lodi Amish. Ashland meant the grey SMV sign using Amish. This article is the first time I have heard of the Swartaentrubers refered to by the county name, so I was rather confused who these people are for most the article. Lance you are right they are often referred to as Lodi Amish–that’s actually how I first heard them described. Ashland and Medina seemed a better description in some ways–unless I missed something Lodi seemed to be at best on the edge of this community. But thanks for mentioning that, I may need to stick a reference at the top that this is the Lodi group. In fact I just did that. Thanks for sharing more from your experience by the way. It is always interesting to read your posts. Alice Mary the logo is down just temporarily for “maintenance”, but I’m glad someone noticed 🙂 Should be back soon. I am also going to look into the subscription service, I am sorry you haven’t been getting the emails. For the time being if you drop by here Monday through Friday you should expect to see a new post each day, usually by 7 AM Eastern Time. Unfortunately, I’ve found Feedburner, the email subscription provider, to be a bit patchy in its level of service. I may need to look into switching. Brian, thanks on Lorain county, was not aware. Wish I had more time in this settlement but I plan to be back this summer. Hi Alice, busy sure isn’t bad–sounds like business is kicking into gear! Always glad to hear from you of course. Vicki New Wilmington is on my summer list too, hope you had a good drive through 🙂 Robin, Christina, many thanks. And Christina on the photos I think there may be a “10 views of Ashland/Medina” post in the works so stay tuned! Hello, I’m just responding to slightly-handled order man, and yes, it is consider mennonite country. Even though there are amish in the st. Jacobs Ontario area, there are many mennonite in this area, as well.. I was just down there Mother’s day weekend, and its very beautiful, and something to experience. I think I doing the amish/menonnite tour this year. I have been to St. Jacobs, twice since the Maple syrup festival in Elmira, this past March, and it was fun. I was in Holmes county for Easter. Very wet, but still had a great time. My brother and I just came back today, from Clare, Michigan, and attended the Yoder farm sale. That was the best, there was loads of people selling everything (300+ booths). They have this sale twice a year, next one before Labor day. If you get a chance, go..and in August I will be in Shipshewana before Labor day weekend, I can’t wait to go. I’m touring these areas and having the best time ever. Following this site, you learn about new places to explore. Probably back to Holmes county for Thanksgiving, and now I can explore more of Ashland and Medina county. Thanks Erik for a wonderful site. I was just in the St. Jacob’s ON area too back in March. Unfortunately, it was a Sunday so I didn’t have an opportunity to visit any farms that would have been selling syrup! I got a few buggy sign photos (open buggies too)! Unfortunatly I was a luddite on this trip and it’s on old school film. When I get my scanner running I’ll email them to Eric. Lance, your post was quite interesting, and I did take time to look at some of the photos you referred to on the link you included. I’ll go back for more! Thank you for including it! The “bathing once a week” tradition isn’t just Lodi Amish-related! When I was growing up, I remember taking a bath on Saturday night (just doing a “sponge bath” the rest of the week, as a kid). It was still part of our Polish-American (poor, I guess) tradition. It makes me squirm nowadays! (Eeeuww!) Although, if you’re not “social”, does it really matter? Still, I’m so thankful for hot running water! Marie, Lindsay, and anyone else who frequents ANY Amish/Mennonite territory, I’m looking forward to your photos, too. It’s not likely I’ll ever get to those places, so photos are the next best thing to being there. Do you want to hear something truly gross sounding? No, well, I’ll tell you anyway. People, so I am told, used to bath in accordance with the Seasons. Have a bath in the Spring, when it gets to be summer, sometime in the winter. That goes well beyond monthly or weekly baths. The thing that we don’t think about however is that if people only bathed once a season, they did do some periodic cleaning every so often, a sponge bath for instance, or a dip in a creek or something, but a full on bath used to be rare. Makes one consider, with great glee, why the perfume industry developed and prospered, eh! Apparently, our oils in our skins have a protective quality about them. Not to mention that the soaps used did not have a lot of nasty chemicals, like parabens (that cause cancer), etc. Bathing once a week was rather common until about the 80’s, and some still maintain that schedule (amongst the general population), even today. They didn’t have to ‘supplement’ their hair with additives since the natural oils would do that without damaging the hair. Alice Mary if I remember right you’re in Chicagoland area? In the loop there is a Rise N’ Roll store about Clark and Monroe run by the Amish selling everything from jam to fresh baked goods to meats and cheeses. The store workers are young Amish women who I have to say are just awesome people. The prices are a bit high IMHO, but it’s nice to be able to buy a shoo fly pie in the loop! Alice Mary, glad to hear it got posted–sometimes it might not show up immediately as it might have to refresh. Lindsay, I’ll be looking forward to any shots you send! And Marie, thank you for sharing what you know too–that’s one of the big positives and things I’m grateful for on Amish America–a lot of folks taking the time to share a bit about their experiences, which definitely makes it a better site. I only come on this site once in awhile, but I enjoyed your article. I live in Medina County and this group of Amish mix very well with the English, mainly because of the Amish Produce Auction that runs several months a year. It is good for their business, to be open to relationship to an extent, with the English-It is a VERY sucessful produce auction and probably is a great blessing of God’s provision for them. I have met some Swartzentrubers here, on side of rode too, selling their baskets/pies/bakery and have enjoyed really, nice conversation with them. Also exhanced correspondence with couple of the women I met in fabric store-and they were not avoiding, my company-so for the most part, this would be an extremely interesting stop for a visitor, this produce auction is phenomenally spectauclar to view-the many, many wagon loads of produce,plants, etc that are auctioned off-is incredible to watch how it all works-MANY grocers, nursuries, organic markets, come to bid on their produce, some of which is organic! A favorite pastime of mine, to attend! Thanks for the article, come and see for ourself if in the area! I didn’t know about the Rise ‘n’ Roll store in Chicago. I don’t get there very often (once every couple of years—just too hard to take the train, or find parking—expensive, too—)but I’ll definitely try to make it to the store next time I’m there. I wish they’d come to our area. We’re just starting a farmer’s market, but it’ll be on Sunday, so there won’t be any Amish selling their wares! Phooey! Alice Mary, just wanted to ask if you are still having issues receiving the blog subscriber emails from Feedburner. I checked your email on the master list at Feedburner, and it says you have an “active” subscription, which puzzled me since you said you aren’t receiving them. In theory, you should be getting the emails…I’ve heard that sometimes they might get filed in the junk or spam email box, have you had a chance to check those? Anyone else that may be subscribed and isn’t getting the emails, I’d recommend trying that, and let me know if you find anything. The sender should be listed as “Amish America”. Hello! 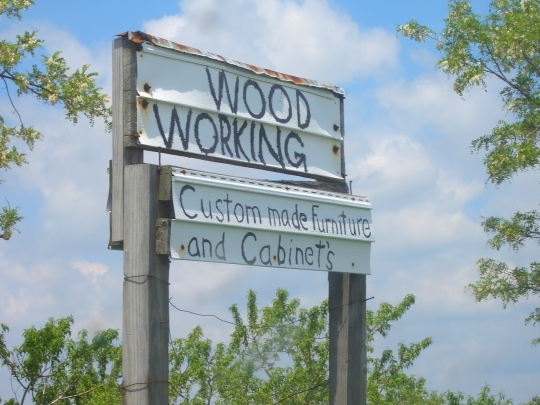 We live by the “Lodi Amish, and have a good relationship with them.I wonder if folk’s realize that they make really beautiful and well crafted furniture in this area.It would be a shame not to mention this fact. We have quite a few piece’s of there furniture,and the quality is great.Also there are numerous cabinet shops in this area as well.They are good neighbors and we are glad to live here Thank’s! We lived in the southermost point of Lorain Co. for 7 years, and in greater Lorain Co. our entire lives. I’m not aware of any Amish living IN the county, though they are directly across the border in Medina Co., beginning in significant numbers about Black River School Rd. To those concerned with the Cancer Victim Sara Hershberger, the information below may be helpful. If possible her parents should view the Video,”Dying To Have Known”, it’s a DVD available from the Gerson Institute on the Internet. There is a Natural means of Cure and the Hersberger Family, as well as the Amish Communities may be interested. That Cure can be found at the Gerson Institute. Cancer was cured in the U.S. prior to 1913 and all the doctors and holistic practitioners, who actually cured “Cancer” were victimized by the American Medical Association (AMA), the Federal Drug Administration (FDA) and the actual cures were suppressed because the remedies cost pennies on the dollar. The Drug Companies, or the Medical Industry, who seek profits over cures for health, cannot patent those remedies or cures. 6. Biochemists Dr. Ernst T Krebs and his son produced Vitamin B-17 in the 1950’s, which cured Cancer. 7. Dr. Paul Goss, Master Iridologist of New Body Products does not treat Cancer specifically, but has restored the health of a number of people who had Cancer, using Herbs and change of diet. 2. The Persecution and trial of Gaston Naessens: The True Story of The Efforts to Suppress an Alternative Treatment for Cancer, AIDS and Other Immunologically Based Diseases, by Christopher Bird. In our area of northern Richland County, Ohio, there is a group of Horse and Buggy Mennonites, too. Also, many of the Ashland Amish that live near the town of Ashland consider themselves to be Old Order. I visited the Mennonite community near Shiloh once with an Amish friend, we stopped by a large store there. Drawing a blank on the name. Hello dear sirs: I´d like to know the requirements of the Ammish commumity for a man who wants to live happy. Well. I am Christian, 56 , no children, heterosexual, single, wanting to live a peaceful life within a God´s pointed habitat. No matter the work be hard, I have a good phisical complection. I studied business and civil engineering. Good knowledge of the bible and a good behavor. Id like to marrie a good Amish women who loves God. So, would you please write me about it? I grew up Amish in the Ashland community back in the 1950’s and 60’s. I left in 1969. I went in the military two years later. After I got out of the military I moved to Texas. I never went back home until about 20 years later. Then just once, because to my parents I wasn’t their son anymore because I left the Amish.